During September, I will work on a craft project for the monthly theme. Around September 28, I will post my completed project. You can share a link to your project on that post or at any time during the month on this post. 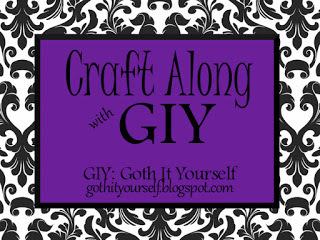 On September 30, I will compile the links on the Craft Along with GIY page. I have some wings. Just need to figure out what to make with them. Ooh, neat idea! I would love to see it. Oooh no. I just got a free-standing jointed raven and bat embroidery design for my machine! I smell quite a few projects to make up for the ones I have missed out on... haha!